I've been spending lots of time in my Dad's Custom Carpentry Workshop recently and I think his passion for wood rubbed off on me. Whilst making handmade chalkboards for Eid gifts in his Workshop, I decided on a tablescape for this Eid with natural elements. Our vintage Scrabble letters Eid sign! Looove! Our trusted Birdcage dressed with some rustic greenery and two wooden birdies. 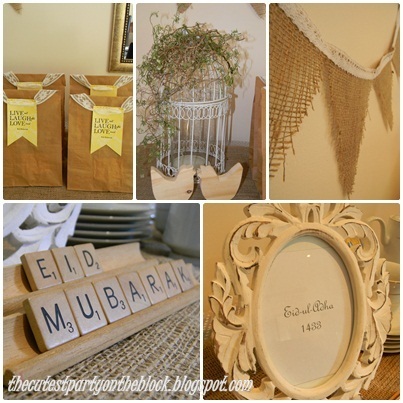 Our Eid gifts...We turned ordinary pieces of wood into chalkboards and added a strip of ribbon to each. We added a stick of chalk and a little message too! The packaged chalkboards all wrapped up! There had to be buntings, and hessian buntings this time, trimmed with crochet lace ribbon. A very sweet sister Fatima contacted us to prepare a birthday table for her brother Yusuf's 18th Birthday. She described him as a funky fun guy and she sent us a pic of him and his white VW Beetle. 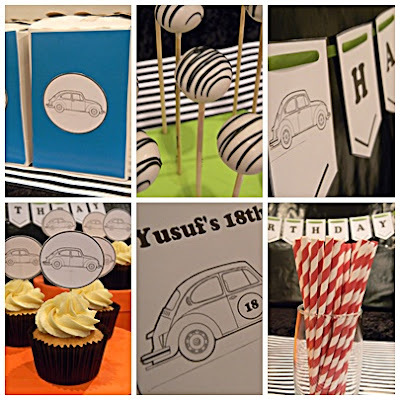 Instantly falling in love with the car, we decided to use it as the basis of the decor while adding pops of colour to show off Yusuf's fun personality. The VW Beetle image we used through the decor. We added the VW image to these boxes that we covered blue and filled with popcorn. Yummy baked goods by Nabeela's Bakeshop styled with pops of bright colour. Red barber striped straws. Contact us for purchase info. We' ve got lotsa colours too. Yusuf with his uber-cool VW Beetle! This sweet baby blue event was a Baby Viewing to welcome little Zayaan into the world. His Mom, Bahia, decided on the colour scheme to celebrate the birth of her first son with friends and family. We used these fine lace patterned paper doilies to create the buntings that spelt the little bundle's name. Tissue paper pom poms! We can't get enough! White ones were the perfect fit this time! 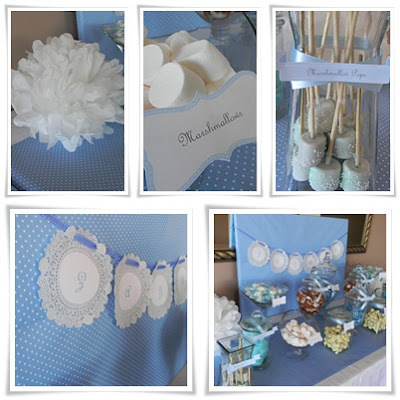 These marshmallow pops were created by Nabeela's Bakeshop to suit our theme. We created food tent cards for the event too. Congrats Bahia on your new bundle. May he bring you joy always!